(i) By varying N with both fr and fm constant. (ii) By varying fm and N with fr constant. (iii) By varying fm and fr with N constant. It is helpful to consider the PLL in terms of phase rather than frequency. This is done by replacing fo, fm and fr by θo, θm, θr and respectively. 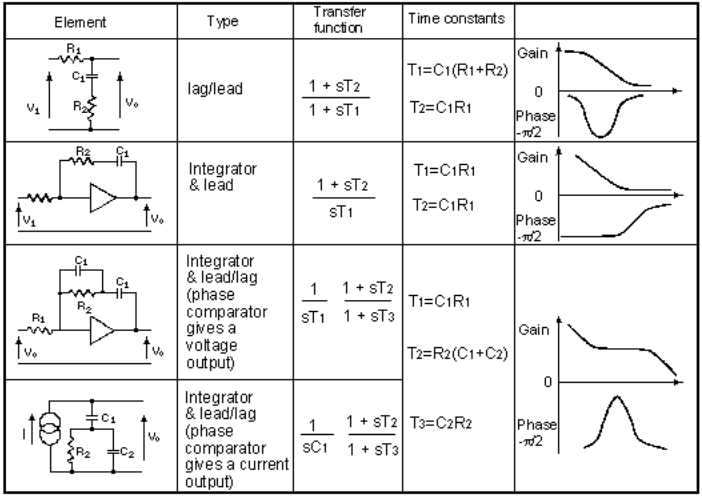 Table 1 shows the transfer functions of the various loop elements with this change made, and Figure 2 shows the circuit. 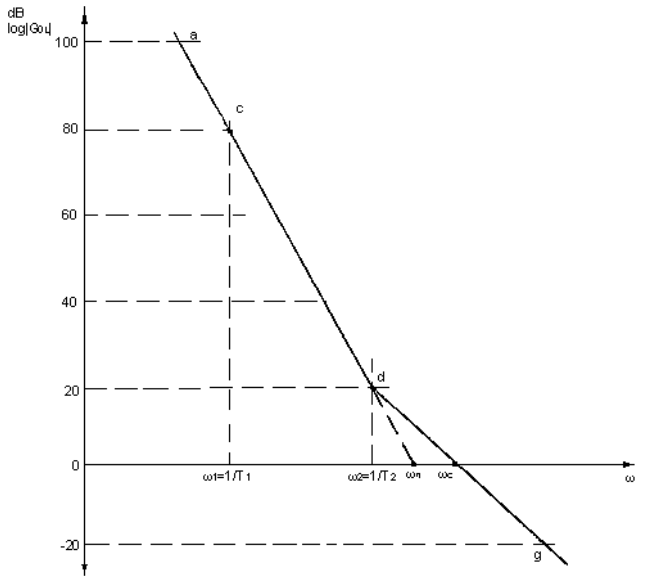 (i) By changing the phase, θm of the mixing frequency. 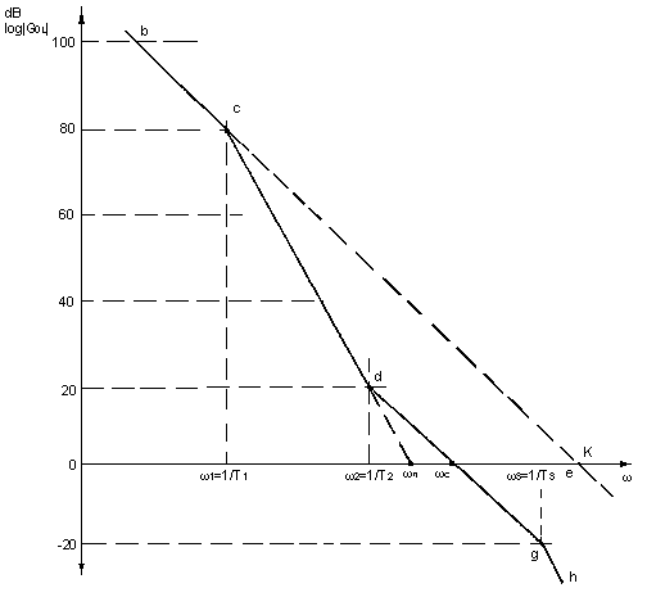 (ii) By changing the phase, θr of the reference frequency. (iii) By changing voltage V at the modulation port. Where V is the voltage input at the modulation port. 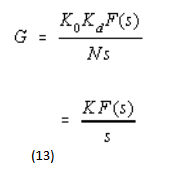 The terms K/s (equation 7) and K/S2T1 (equations 8 and 9) may be expressed, in the frequency plane, by gain lines having slopes of -20 dB/decade and -40dB/decade respectively, as shown in Figure 3. Figures 4, 5, and 6 show the effects on the open loop gain of the three filters given in Table 2. 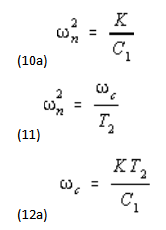 (i) Figures 4, 5, and 6 show the effects on the open loop gain of the three filters given in Table 2. (ii) Figure 5 shows the response when the integrator plus lead network is used. In the region acd, the gain is falling at 40dB/decade. 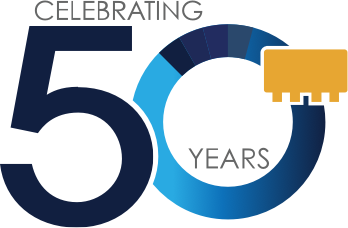 The choice of the phase detector is determined primarily by the application. For receiver applications where low noise signal levels are encountered, double balanced mixers are used as phase detectors. For synthesizer applications, a digital type phase detector is preferred. This type of phase detector produces a current output. 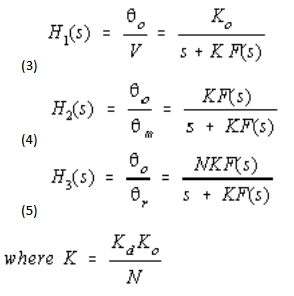 The transfer function, Kd, has units of amps/rad. 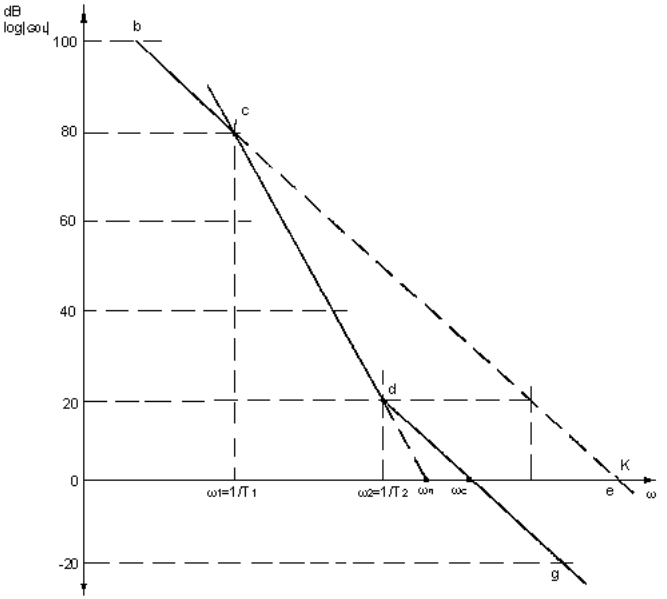 The line bcdgh in Figure 7 represents the response for this phase detector/filter combination. If the phase detector is not ideal but has a leakage resistance RL, then it can be shown that T1 = RLC1 and the open loop unity gain frequency (point e on Figure 7) is given by K1 = KR1. For an ideal phase detector there will be no leakage, and hence ω -> 0 and K1 -> ∞ . One effect of adding a filter is to reduce the open loop unity gain frequency from K(or K1) to ωc. Frequencies below ωc will be called in-band and frequencies higher than ωc will be called out-of-band. The phase locked loop uses its in-band gain to enable the VCO to follow that of the reference frequency, and uses its out-of-band attenuation to reject unwanted phase components that may be present on the reference signal. Consequently, in most applications, the response bcdgh, given by the integrator plus lead/lag network, is preferred. 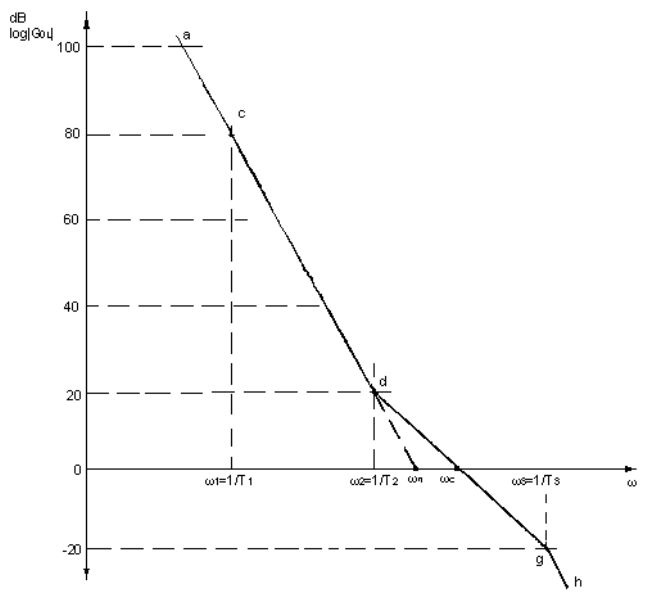 A brief analysis of the phase noise performance of the PLL is given here. The noise model is presented in Figure 8 along with the equations 14 through 17. 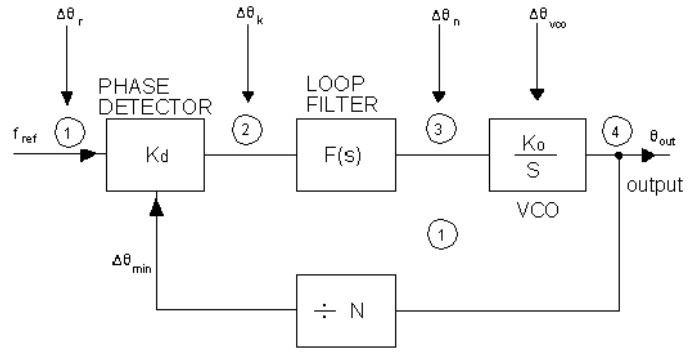 For type 2 phase locked loop, the filter consists of an integrator combined either with a lead network or with a lead/lag network. 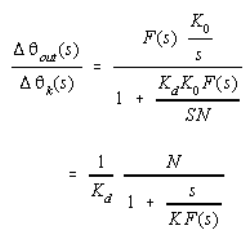 The reference noise and the divider output noise contribution calculations follow. The loop division ratio must therefore be minimized so as to minimize the divider noise contributions. Here Ko is the VCO gain constant and Δθn any noise voltage appearing before the VCO. The phase noise combination of the reference oscillator, dividers, and the VCO, are shown plotted in Figure 9. In conclusion, within the loop bandwidth the reference noise will be multiplied by the loop division ratio. 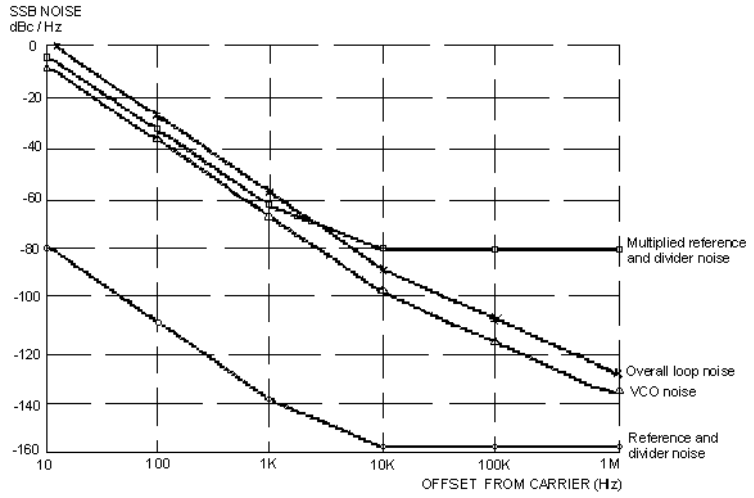 Outside the loop bandwidth the reference noise will be attenuated by the loop transfer function. Within the loop bandwidth, the VCO noise will be attenuated. Outside the loop bandwidth, the noise will be the same as that of the free running VCO.